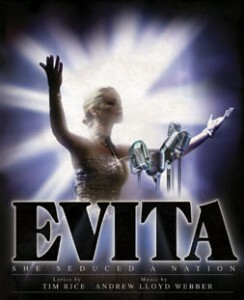 The inspiring story of Eva Peron and her life is brought to the stage in the Gaiety Theatre by Bill Kenwright, which features some of the most beautiful music from Andrew Lloyd Webber and Tim Rice’s musical Evita. From the minute our tickets are upgraded, alarm bells are ringing. The theatre is empty for a Monday night. We take our seats for this supposedly inspiring extravaganza. Yet inspiring is not an appropriate description for this amateur construction of Evita. Evita is a very disappointing show from start to finish. It was a bad production of a fantastic musical, as it was corny, annoying, laughable and dire. The actress who plays Evita, Abigail Jaye, brings to the stage a soulless, overacted version of Eva Peron. Jaye has a good catalogue of musical roles and there’s no doubt she can sing, but this is not one of her best roles. Jaye’s is not the only performance at fault: the whole ensemble did nothing for me. The main actor and narrator who depicts Che does not have a strong enough voice for this part, which is a shame. This is one of my favourite musicals, but sadly I don’t want to hear another song from Evita for a long time unless it is by Elaine Paige. There was a good reaction from other people, but overall it was mixed considering you could nearly count how many people attended Monday night’s show. Roll on The Shawshank Redemption in May.